I have forgotten the password or username for my Google account, or I'm unable to access my account for other reasons. If your browser remembers your password (that is, the password field is automatically populated when you log in to your Google account, and you're able to log in), you should be able to retrieve your password through your browser's password manager. In order to recover your Google username using this form, you must already have specified a recovery email address or recovery phone number. How do I prevent losing access to my account in the future? See How do I protect my Google/Gmail account? Gmail Account Recovery - Google couldn't verify it's you, so you can't sign in to this account right by bkc561 posted on Aug 30, 2016. Forgot my Gmail password and SIM card - how can I recover my password? What do I do if I forgot my Gmail password? Recover Gmail password from iPhone or phone number? 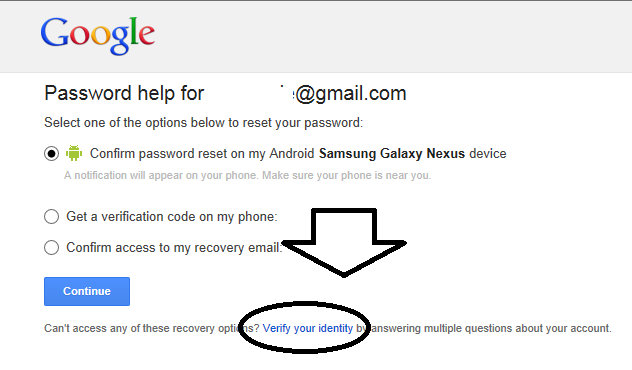 How do I recover my Gmail account without using two-step verification? How do I recover the Facebook account password?